The key to toned and happy hamstrings is to stretch them! The back of the leg will look more sculpted and elongated when you remember to give your hamstrings the love & length they need. Our seated hamstring stretch is ideal for warming up your muscles before and after your workout. It’s also so simple that you can do this anywhere, so let’s take a moment to elongate our hamstrings together! Sit on the floor and extend your legs in front of your body. As you straighten them, you’ll already feel a stretch along the back of your legs. Raise your arms up and drop your shoulders to get your back muscles in on the action as well. Fold forward over your legs. If this movement feels a little tight, don’t worry about touching your feet yet. Flexibility comes with time and requires patience. Instead, place your hands on your shins and keep your torso higher if that allows your legs to straighten. The secret ingredient to The Bar Method’s signature sculpted and elongated thigh muscle is stretching the quads when they are most moldable, after thigh-work, but this is another stretch that can be done anywhere, anytime! Hold onto something supportive with your left hand and place your feet under your hips. Soften your knees. Hold onto your right foot with your same side hand. Align your knee under your hip. Grip your glutes, pull your navel in and tuck your hips under. You will feel this lengthening your quads and hips flexors. Upright your spine to deepen the stretch and improve your posture. Keep this stretch in mind next time you get up after sitting for a long period of time and have that feeling of ‘ooof’. Take a few minutes to try our standing quad stretch and make sure to perform both sides! If it’s 4:00 PM during the work day and your body needs a little pick me up, then our waist stretch is for you. Start by placing your left hand on something to support you. Stand up tall and cross your right ankle behind your other. If the sole of your stretching side foot can’t touch the floor, place the top of your foot on the floor instead. Reach your left arm up and side stretch over in the opposite direction. Feel the stretch run along your obliques all the way up the side of your extended arm. Switch sides. We spend a lot of time hunched over computers, cell phones or a steering wheel. Combat this with a chest stretch to open the front of your body. Come down to your hands and knees. Extend your arms in front of you and shift your torso forward until your chest is lower towards the floor. Stick your hips up and keep your thighs aligned vertically. After holding this stretch for a few seconds, you will understand why our furry friends give themselves this stretch so often! If you’ve taken a Bar Method class before, then you know the booty burn is REAL. 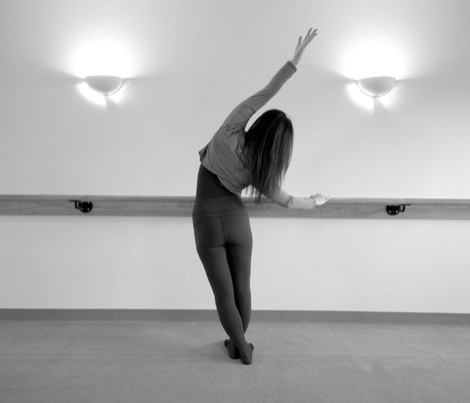 But whether you are a barre devotee, or just looking to tone your peach, our glutes stretch is the cherry on top for all of your efforts. After all of your hard work sculpting the side of your seat, mold your glutes muscles closer towards the bone with the glutes stretch. Sit down on the floor and bend your left leg in front of you at a 90-degree angle. Rest the side of your thigh and shin on the floor. Bend your right leg. Hold onto your right ankle and knee, one in each hand. Gently place your top right ankle on top of your bottom thigh so that your shins align one on top of the other. If your top knee is higher towards your torso or out to the side, that’s ok. Flexibility is personal and you’ll still get a great stretch, even if your knee is higher. If you want a deeper stretch, slowly walk your hands forward or press from behind. We know you’ve been working hard to lift your seat, so make sure your hard work doesn’t go unnoticed and complete your seat work with this Bar Method favorite. We take care of our bodies through diet and exercise, but it’s time we also care for our bodies through stretch. So sign up for a Bar Method class or perform these stretches at home, and your body will thank you later.